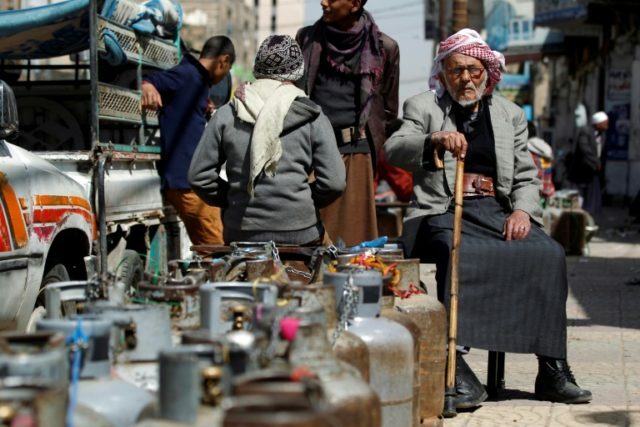 Sanaa (AFP) – Long queues of men line the streets of Yemen’s rebel-held capital Sanaa waiting alongside empty propane gas canisters they are desperate to replace so they have fuel to cook. Three years of war accompanied by a crippling Saudi-led blockade has led to chronic shortages and with them prices that are skyrocketing. The price for a refill of cooking gas has more than doubled in recent weeks from $12 (10 euros) to $26 (21 euros). Longtime Sanaa resident Mohammed Khaled Hussein said he had been waiting three days for a replacement canister to take back to his family with the hope of at least making tea and rice. But each time he went home with the empty one. “I’ve still not been able to get a replacement canister and today I found out that prices have soared again,” Hussein said. Supporters of the Huthi rebels accuse the Yemeni army and its Saudi-led allies of blocking fuel supplies to the capital and other rebel-held areas across the north. Other Sanaa residents, however, say the rebels are to blame for imposing a hefty fuel tax. Restaurateur Talal Sharaf al-Qudsi said he had been forced to close his doors after the shortages left him unable to run his ovens. Bus driver Shihab al-Hashidi, whose vehicle is his sole source of income, says he struggled for days to fill up his tank. “One day you manage to fill your tank, then the next two or three days you’re stuck parked without fuel,” said Hashidi. The crisis has seen residents turn to other forms of fuel, including firewood, as they attempt to adjust. “The crisis is suffocating us,” said Ahmed Ali Mohammed, who sells wood for household use. Outside the capital, the shortages are even more devastating. The United Nations says 22.2 million people are dependent on food aid, of whom more than eight million people are at risk of famine. The war has hit food production and the Saudi-led blockade has halted all but very limited commercial imports of basic foodstuffs. Lack of access to safe drinking water has seen cholera infect 1.1 million people since April 2017 in the world’s worst outbreak. Saudi Arabia and its allies say their blockade is vital to prevent arms shipments reaching rebel-held areas, particularly missiles like those the rebels have launched multiple times into the kingdom.